If you have been involved in a work injury and you are experiencing pain in your thigh and leg along with numbness or tingling, you might have a herniated disc (also referred to as a slipped or ruptured disc). This kind of work injury occurs when the cushioning in your spine (the disc) becomes damaged and bulges or breaks open. What Causes a Herniated Disc and How Will I Know if I Have One? Pain typically in one leg or arm: If the herniated disc is in your lower back, you will feel pain in your buttocks, leg and thigh. This is called sciatica and it is one of the most common tell-tale symptoms of a herniated disc. The pain might even extend to part of your foot. If the herniated disc is in your neck, you will feel pain in your shoulder and arm. Coughing or sneezing may cause the pain to radiate down your arm or leg. Tingling or numbness: You might experience these symptoms in the body part that is most closely intertwined with a damaged nerve. Weakness: Muscles that are intertwined with the affected nerves may weaken, causing you to trip and fall or preventing you from lifting or holding items. If your herniated disc is not pressing on a nerve root, you might not have any pain or you might experience a backache. Since a herniated disc can be very painful with symptoms that last weeks or months, you should seek medical treatment as soon as possible. Your doctor will perform a physical exam and, if it's clear that you have a herniated disc, they might not order tests. However, if they can't provide a definitive diagnosis through a physical exam alone, they might order a CT scan or MRI. Surgery: when other treatment fails, surgery might be necessary to remove a disc fragment lodged in your spinal canal. About 1 of every 10 people with a herniated disc requires surgery. How Can I Get Help With My Work Injury Claim? 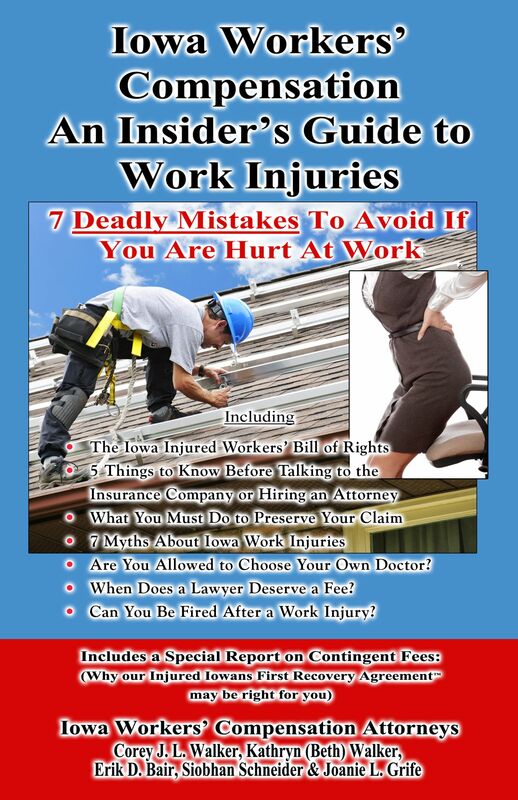 To learn more about Iowa's workers' compensation system including the 7 Deadly Mistakes to Avoid if You are Hurt at Work order a copy of our book “Iowa Workers’ Compensation- An Insider’s Guide to Work Injuries” by clicking here or by calling 1-800-707-2552 (ext. 811) (24 Hour Recorded Message). Why offer a Book at No Cost? Iowa Workers' Compensation Attorney Corey J. L. Walker offers his book at no cost because he has represented hundreds of Iowans hurt at work and seen too many clients make mistakes before they knew about their rights and responsibilities costing them thousands of dollars. Iowans injured on the job are beginning to realize that the work comp. insurance company is not there to help them and they should at least consider having someone on their side to help them. Finally, you can learn about Iowa work injuries in the comfort of your own home with no cost, risk or obligation. For immediate assistance call 515-440-2852 and ask for Corey or Erik.